I am not sure what the difference is here between these two options - why would allowing interest to capitalize be a good idea? What exactly does it mean by a 'refund'? And by "payments you make within 120 days", does it mean payments other than my automated payments? I have currently completed my studies for the foreseeable future, and am now in the process of paying my loan off. 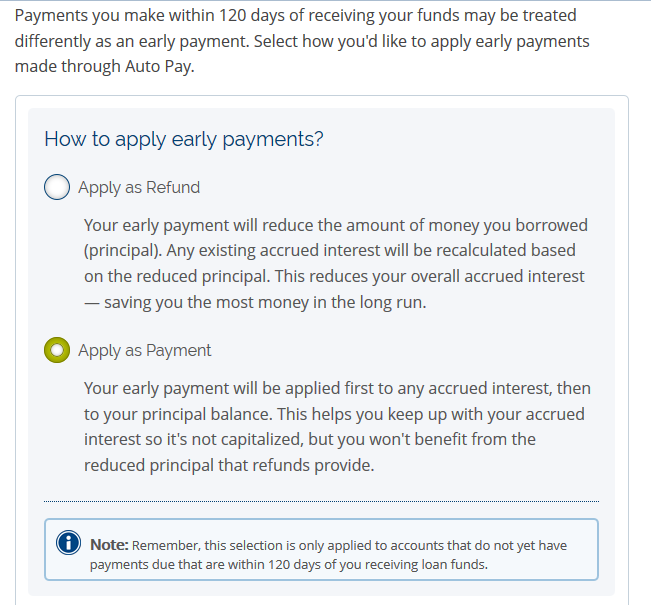 Ideally, I would like to be paying the least amount of interest over time, and have the total amount still due on my loan paid off as soon as possible, so what exactly would the better option be here? Additionally, for those curious, the loan organization is Great Lakes. This election only applies to payments that you make within 120 days of your having received loan money. These wouldn't be required payments, which is why they are called "early" payments. For example, let's say that you've just received $10,000 from your lender for a new loan. One month later, you pay $500 back. This election decides how that $500 will be applied. The first choice, "Apply as Refund," means that you are essentially returning some of the money that you initially borrowed. It's like you never borrowed it. Instead of a $10,000 loan, it is now a $9,500 loan. The accrued interest will be recalculated for the new loan amount. The second choice, "Apply as Payment," means that your payment will first be applied to any interest that has accrued, then applied to the principal. While you are in school, you don't need to make payments on student loans. However, interest is accruing from the day you get the money. This interest is simple interest, which means that the interest is only based on the loan principal; the interest is not compounding, and you are not paying interest on interest. After you leave school and your grace period expires, you enter repayment, and you have to start making payments. At this point, all the interest that has accrued from the time you first received the money until now is capitalized. This means that the interest is added to your loan principal, and interest will now be calculated on this new, larger amount. To avoid this, you can pay the interest as you go before it is capitalized, which will save you from having to pay even more interest later on. As to which method is better, just as they told you right on the form, the "Apply as Refund" method will save you the most money in the long run. However, as I said at the beginning, this election only applies if you make a payment within 120 days from receiving loan funds. Since you are already out of school and in repayment, I don't think it matters at all what you select here. For any students reading this and thinking about loans, I want to issue a warning. Student loans can ruin people later in life. If you truly feel that taking out a loan is the only way you'll be able to get the education you need, minimize these as much as possible. Borrow as little as possible, pay as much as you can as early as you can, and plan on knocking these out ASAP. The second choice is a normal payment, just made early. This guards you against forgetting to make the payment later and incurring late payment fees -- which in this kind of loan are added to the balance and themselves accrue compounded interest. The first option is an extra payment, applied entirely to the principal. That lets you avoid years of accrued interest on that portion of the loan, and reduces the loan's actual cost. I think the extra payment is a better investment.